One of the graduating class of the Randolph Academy have produced this dynamically staged and well-acted play, and its aand appreciably ambitious work. Like the HBO show with which it shares its name, Big Love focuses on a group of sister-wives (though instead of three, it’s about a dozen) who have grown up in an insular communal society (or, uh, “cult”). American playwright Charles L. Mee’s work is a conscious update of Aeschylus’s The Suppliants. Both plays are about a large group of women who flee forced betrothal and try to take refuge in a nearby kingdom. In Aeschylus, that refuge is Argos. For Mee, it’s a ship off the Italian coast. The play begins excitingly with a wildly energetic bachelorette party, with most of the cast emerging rapidly from behind the Annex audience and onto the thrust stage, dancing exuberantly. Then, gradually, all fall still. We next see them on a boat somewhere off the coast of Italy, where they have taken refuge from their community that intended for them all to marry their cousins. The women discuss wanting to break free and live their own lives, free and separate from these men, with some enthusiastically endorsing their escape and others arguing for the security and assurance that marrying a man marked for them by their community will bring. The gender politics that are discussed are in a similar vein to Aeschylus’s original work. As a result they are not exactly revelatory, and at times regressive in the very basic claims they make for a liberated woman, but they still alas have resonance. And taken in context of these women having lived insular lives determined by a strict patriarchy, the conversations make particular sense (this focus on gender dynamics curiously means that despite its mostly female cast, there are very few scenes in this play that would pass the Bechdel test). 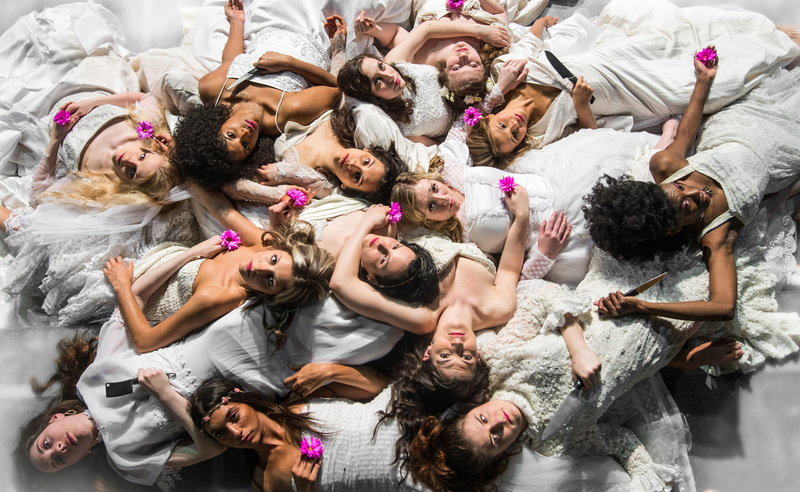 Mee’s text is written in the same blunt expositional style of a classic Greek work, and its an influence which is complemented by these women’s Greek origins, their chorus-like appearance (designer Hannah Puley has fitted them in torn and billowing white dresses), and passionate dances. Though there are a few occasions where members of the cast wander around a bit when they aren’t the focus of a scene, director Zack Russell mostly does a very good job of handling the large ensemble and frequently busy scenes. It is the musical sequences that are the most memorable, though – – choreographer Lisa Auguste has created powerful movement pieces which act as visceral representations of the social traps within which both the women and the men (who track them down) find themselves. Russell also stages a hypnotic scene by setting it to a cover of The Knife’s “Pass It On” that had me wishing more of the dialogue-driven plays at Fringe had made more innovative use of music. With great ensemble work from the whole cast (Rashaana Cumberbatch, Cindy Goh, and Shannon Tosic-McNally, representing the central trio, are all strong and distinctly played), and its engagingly staged story, Big Love has a lot to give. I’ve dinged a few plays at this year’s Fringe for featuring static blocking that puts the onus on performers to engage the audience purely through their own presence, with little directorial guidance encouraging them use the space in an interesting way. Sean Reycraft’s One Good Marriage has its central couple basically standing and staring at us for its entire hour, with little movement aside from standing up, and sitting down. Yet director Jessica Rose ensures that they hold our attention, and indeed too much movement or physical articulation of the dark and at times deeply funny play would undercut its power. The husband (Matthew Gin) and wife (Becky Shrimpton) tell us about how they first met (she is a teacher; he is a librarian), and about their ethereal honeymoon where they found themselves bonding over being cut off from the world. The story then takes a grim and compelling turn when they describe their return, with the couple receiving news of a catastrophic tragedy that occurred while they were gone. Like a short story by Lynn Coady or George Osbourne, the devastation of the event is treated with a quirkily pragmatic and analytical perspective by the couple, until things slip further into despair towards the end. The choice of a small side room at Trinity St. Paul’s is made darkly and hilariously clear in the final few minutes – – a sharp subversion of the reflectively melancholy tone on which you think the play will end. Both Gin and Shrimpton are excellent – – Shrimpton naturally on-guard and quick to defend herself and her emotions, and Gin displaying a contrasting congeniality that melts convincingly into despair. The two are clearly immersed in the text, and have a natural back-and-forth strong enough to ensure that I rarely found myself thinking about it during the performance. This is coming very late, but if you’re in the mood for a strange and memorable story, compellingly told, get yourself to church. I admit to watching Slice of Pi’s A Drop of Water in a state of festival fatigue, and as a result spending the first ten minutes being unsure of the main plot as my mind ricocheted through the events of the day and worrying how little of the story I was actually taking in. What initially came through were the austere, low-key but cleanly choreographed movements of the three actors (Rhiannon Brönnimann, Claudia Carinao, and Christina Leonard), as they reflect on the death of a loved one, Gwen. Gradually it becomes clear just how Gwen was connected to all three women, and how they are bonded together by having known and lost this special woman. The piece is made up of low-key but carefully synchronized dances that complement the series of circulating monologues delivered by the actors. These dances are supposed to reflect the water cycle, as the women work through their grief through text and dance, ultimately reaching a point where their despair is able to dissolve and they can begin the next stage of their lives. As a concept it is a touch vague, and the execution is occasionally a little sleepy (or maybe that was just me), but it is confidently performed by all three actors, who developed the piece together along with dramaturge Dana Dyal Deoraj. The play has a strong Canadian short-story vibe to it. I don’t really know what that means, but it feels right. You know when a friend is telling you a funny story, and you slowly realize that what they’re telling you is less funny than it is profoundly worrying, and you become concerned for your friend’s safety? This is the experience that Zabrina Chevannes takes us on (with far more self-awareness than this hypothetical friend) in her one-woman comedy show, where she relays anecdotes about growing up in Toronto with her Jamaican parents, being a nurse forced to deal with perpetually horny men, and most startlingly, contending with a husband who turned into a religious zealot and cult member. Chevannes’ tone throughout is light and conversational, exactly as if she were a friend at a party reenacting a funny story. So when she suddenly begins talking about her husband who believed she was demonically possessed and from whom she tried to escape before being violently attacked by him in her kitchen, the lack of shift in Chevannes’ style of delivery is at first disconcerting, and then sort of fascinating. Every obstacle that she has had to deal with, whether it be a weird hospital patient or a murderous spouse, is treated with the same “O.K., what’s next?” sense of bemusement, and it ultimately kind of works (though it should be noted that this play is not a sensitive commentary on how to engage with people suffering from mental illnesses, nor is it probably meant to be). As a nurse, performer, daughter, sister, mother and wife, Chevannes is much busier than the average stand-up comedian. Her practical attitude and funny reenactments of the people in her life is itself a commentary on how she negotiates the many stresses of her day-to-day experience while maintaing the wry outlook on life that she successfully brings to the stage.